Hayashi is another one of those so-good-its-only-for-lunch spots. Yeah, some of the best ramen in town is only open for a few hours a day. If you find yourself on some sort of Shibuya adventure come high noon, this should be your first thought. Another point about this type of shop is the menu. 2 or 3 items. The only word I can think to describe this soup? Golden. It's smooth, but not too creamy. The shop has no smell, but when the spoon hits your lips, the goodness is almost overpowering. It's the best bowl in the vicinity of the station, no doubt. If you have trouble finding it, it's next to the VIP, championship-winning nail salon. Yamagata ramen was the adventure of the day, and the most notable place serving it in Tokyo is a cafe in Ginza. Espresso with your ramen? Go for it. The most popular ramen here is the Yamagata sui-ramen. A cold bowl, make that ice-cold bowl, that I don't really have much interest in. Moving past the soy milk curry and locomoco lunch sets, the Yamagata ramen (not frozen!) was an easy choice. 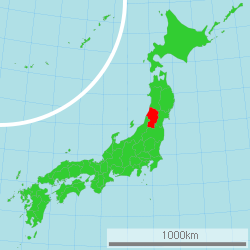 That's Yamagata prefecture up there if you were curious. Yamagata is famous for red dye and expensive cherries. It's also one of the least visited prefectures in this country. Countryside life leads to hearty, rustic foods, and Yamagata ramen follows that thinking. The rich soup is a bit out of place in posh Ginza, where the streets are full of nouveau riche tourists from other Asian countries these days. But the rich shoyu soup is in no way out of place with me. It's great. I don't have many words, just that Pour cafe is a nice relaxing place to have a drink and a bowl of ramen. The flavor is very "meaty". I managed to cross off another from my list. These days they come off faster than they go on. But they never stop going on. Ramen is only served after 11:30! Yonezawa is a few hundred kilometers north of Tokyo. And, of course, this city has it's own ramen style. At least, that is what I was led to understand when I found this place. Despite the chain feel (other shops are located in nearby Otsuka and Ikebukuro), I had high hopes when reading the plaque on the wall proclaiming the wonders of Yonezawa ramen, and the shop's use of some Yonezawa ingredients. I went with the standard shoyu ramen, plus a side of fried rice. Like it's nearby neighbor to the south, Kitakata, it's a simple bowl. Simple in all ways. There are some much better shops in the area, like Nishio Ramen, but Ai Ai is open at all hours practically. I guess it has that going for it. When I asked the chef to explain Yonezawa ramen to me, he grunted and said, "It's where I'm from." I continued my interview by asking what Yonezawa local ingredients he uses. "Just the noodles." It was a short interview. At least it's close to the station. A few days later I was drinking with a friend, a native of Yonezawa, and asked her what is so special about her hometown noodles. Her explanation was a little more eloquent. "When us countryside girls come to the big city, everyone is eating tonkotsu soup; strong-smelling, thick stuff. But back home, we really just love a warm bowl made with our clean mountain water. It's simple, and good." Tomita ranks in at #1 on many ramen lover's lists. But more notable than any single individual's taste is the coveted #1 spot on the Japanese supleks database. I've never been disappointed by a highly ranked (90+) shop on that database. At the time of writing, Tomita is sitting at 97.396. The supleks database leans far left, with liberal party being traditional shoyu and green party being new, robust pork soups. Tonkotsu gyokai tsukemen in particular tends to be ranked high. Matsudo is surprisingly closer to Tokyo than I thought. Often, a shop in a neighboring prefecture requires a few hours of dedicated time. At less than 20 minutes from the Yamanote line, Tomita is closer than many inner city shops. Expect to wait. One staff member is on duty full time, letting you know when and where to sit in line, when to buy your ticket, and when to enter the store. A lot of people bought a take home pack. No wait for that one. Here it is, the coveted tonkotsu gyokai tsukemen from Tomita. Any popular tsukemen will have something about it. Something extra. Most shops of this kind are just good. Rising above "just good", Tomita's soup is a little grainy, with tiny flecks of fish and pork bits sticking to everything that comes in contact. Superb. Little details, like the last minute splash of boiling soup to keep it the right temperature, were noted. The shop will try and serve everyone at once, so that the master can focus on one thing at a time. When you ask for it, the soup owari, broth added to the soup after your noodles are finished, is the best I've had in Japan. At a typical shop, it's just clear broth. Tomita adds that broth, along with ground pork and fresh yuzu peel. You'll leave refreshed, and likely thinking about the next time you can make it back. How I ended up here, I can't say for sure. A lone photo of a wine glass sitting atop a ramen shop flyer is the only clue. It was late, and we had been drinking at a few spots around Hatagaya. Ramen is a natural hangover prevention tactic, and I'm sure no one in the group gave any protest. It's also a hangover cure. A panacea for all occasions. The shop is in a hip neighborhood, and you just might meet a tattooed ramen-fan baby. Maybe. One would assume that a shop named Kushu would be in the style of Kyushu, a rich tonkotsu soup. And that's what it was. A fatty bowl for the late night crowd. 99.9% of the time that I'm in this part of town, Dokkan is the bowl of choice. It still is, but it's nice to know that there are options.